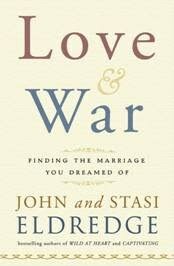 Love and War, by John and Stasi Eldredge, published by WaterBrook Multnomah Publishing Company. While there were some things that I have a different opinion of, for the most part while reading this book–I said WOW. Relevant–Powerful–Motivating. I have one question. WHERE was this book 28 years ago? John and Stasi have gone beyond skimming the surface of the sometimes rough waters of marriage and dove straight down to the heart of so many problems we have as couples. While some writers may hint at some issues they’ve endured as a married couple, John and Stasi get real. The honesty shared in this book will absolutely shine a light in the dark places of your life where you thought up to now were hopeless. From the nit-picky–to the really difficult relational issues. They cover them all with a rare honesty that will have you recalling many of your own problems–even those you simply brushed aside thinking there was no help for them. If you read and enjoyed Wild at Heart (written by John) or Captivating (John and Stasi), LOVE & WAR is the book you should read as a married couple! I would even recommend it to be read before you tie the marital knot bow. It is the vitamin tonic that will help stave off many marital diseases before you are maritally destroyed. You will even find yourself chuckling at the ridiculousness of some things they share, that is until you remember some of your own laughable times of marital bliss. Not only will this book help the individual, but it will be a great tool for young married Sunday School classes. Read it as a couple, but my advice, get two copies–I have a tendency to highlight and write my own notes by the author’s words! My husband would rather read a book before I get my hands on it! This will make a great Valentines gift for any couple! This entry was posted on Thursday, February 11th, 2010 at 1:33 pm	and posted in Book Review. You can follow any responses to this entry through the RSS 2.0 feed. I know John and Stacy personally. That is the retreat that I attended and the men folk went through the boot camp several times before they did the retreat here in Arizona with johns blessings. They are as genuine as they appear. The retreats they have are held in Colorado and are weekend long events at a lodge. My fresh faced mornings are wonderful, even have a good 15 minutes of Bible and prayer now. You were so right it really does make for a brighter day. Will have to read this one next. Reading Love & Respect right now. Going to be blogging about it. Thank you for sharing your insights on this book.